After posting the Olympic qualifying standard earlier this week, South Africa’s middle-distance star runner Caster Semenya is now targeting to go below two-minutes for the 800m in her next race. Semenya, who won gold at the 2009 IAAF World Championships in Berlin, Germany, before having her gender embarrassingly question in front of the world, posted a world-leading time of 2:00.23 for victory at the Athletics South Africa Night Series meeting in Cape Town Tuesday evening. The 24-year-old said she is happy with how things have been going in her build-up towards the Olympic Games in Rio, later this summer and she reveals that her next target is to run sub-two minutes for the first time this season. “I’m quite happy with the work I’ve done over the last few months. I just need to go back and train to get under two minutes,” said Semenya, who was running her first 800m for the season and has already qualified for the Olympics 400m with a time of 51.47. “It’s all about hard work, the mentality. Physically. If you combine all those elements, nothing can defeat you. Semenya hasn’t decided if she will do the double at the Olympics. 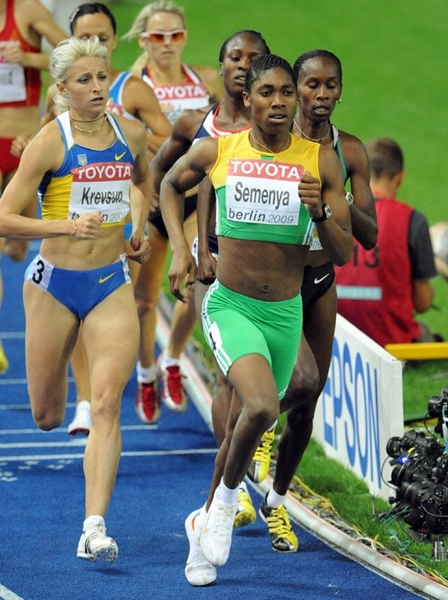 After winning gold in Berlin, where she ran her personal best of 1:55.45, Semenya battled through some very hard times to win a silver medal at the 2011 Daegu World Championships, before grabbing another silver over the two-lap event at the London Olympic Games.